I love birds. I love everything about them. I love to hear them. I love to see them. I love that they can fly. I love the sound of the word bird. I love Charlie Parker. So when I read that fellow bird lover and painter David Tomb was having a show at Electric Works called Borderland Birds/Aves Fronterizas, I put in my request for an interview. Tomb’s exhibition will consist of drawings and installation and will focus on the birds Montezuma Quail, Aztec Thrush, Aplomado Falcon and the racoon-like coati—all creatures who make the United Sates Southwest and Mexico home–borderland creatures. First thing I wanted to know, of course, is why he loves birds. 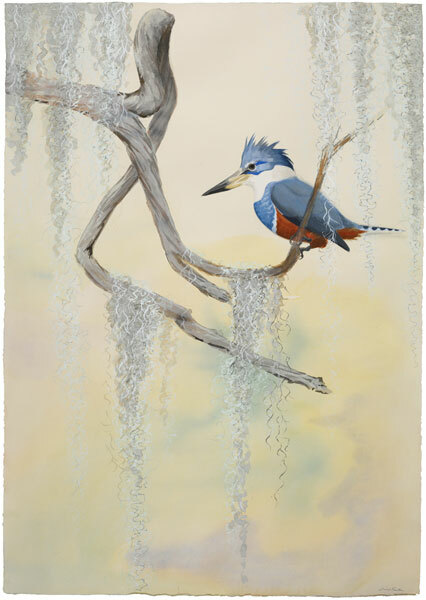 “Ringed Kingfisher,” 2009, graphite, watercolor, gouache on paper, 44" x 30"
D.T. Well, birds are the bees’ knees! They can fly and they are the closest living relatives to dinosaurs. What else do you want? I have a memory from childhood that is like a gothic vision. A group of turkey vultures that, every morning, would sun their outstretched wings in a gnarled snag of an oak tree. My mom tells me that I was mesmerized by this. I just think that birds are a beautiful expression of life. A couple of years ago, I was lucky to encounter the ethereal song of the brown-backed solitaire and see a resplendent quetzal flying through a cloud forest canopy with its tail shimmering and undulating. These are very rich aesthetic experiences for me. In terms of art, birds translate well as a decorative and metaphoric motif. Birds are inspiring. S. A. What can we expect to hear and see at the Electric Works show? D. T. The works on paper (approximately 14 pieces) in the exhibition will feature a number of birds that can be found, at least part of the year, near the border regions. Specifically the Lower Rio Grande Valley in Texas and the Sky Islands in Arizona. In addition, there will be one large-scale piece — 11 feet high by 9 feet wide — of a vignette mountain canyon scene with birds and critters. This piece will have a sound component that is triggered by a motion detector. The sounds will be mostly bird songs, a rushing creek, [that sort of thing]. There will also be a selection of desert plants to augment the pictures and sounds. I like this part because you can smell the soil, water, and plants. It adds a lot and helps transport the viewer into another realm. S.A. Tell me about your grandfather, the painter Sydney Lemos. Any other artists in the family? D. T. Well, I never got to meet Sydney Lemos, but as a kid I looked at his paintings in our house. Sydney was a very good California Impressionist landscape painter. The bulk of his career was between 1920 and 1944 when he died. He went to the San Francisco Art Institute and was friends with Pedro Lemos (no relation) and Maynard Dixon. Sydney’s parents Mabel and William were both artists in Santa Cruz. William was the big personality raconteur type and he was one of the first vendors at the Santa Cruz Boardwalk. William’s sister, who lived in Chicago, was an artist as well. Their parents were both artists also. My mother thinks that one of their parents was an artist as well. OK, back to the future — my brother, Bruce, is an architect/artist and his son, Jason, just got accepted to art school in San Francisco. Whew! S.A. Why does the U.S./Mexico border fence spell disaster for the environment? D.T. I can give you two examples of problems that the border fence presents to earthbound creatures. There are natural animal corridors that animals such as the jaguar use to travel north and south through that region. This fence will stop that natural migration for the jaguar, which can result in either complete isolation of this small population of jaguar in the U.S. or the extirpation of this species in the U.S. In Texas, at Sabal Palm Audubon Center near Brownsville, the construction of the fence will do the same to the ocelot and jaguarundi population. In addition, huge swaths of rich habitat will be clear-cut in all of the areas where the fence is built. This will prevent animal access to the Rio Grande River, which is crucial for their survival. Where the fences are built, there are large denuded areas of land — many creatures will not pass through these areas because they would be too vulnerable to predators — this completely alters the historic environmental landscape. S.A. That’s ironic that it takes environmentalists and animal rights activists, not human rights activists, to call attention to the wall, which I know isn’t the total truth. Human rights activists have done their part, but still. D.T. I’m not an expert on this topic but I believe there are plenty of human rights activists and environmentalists [both] that are voicing their concerns regarding this. Obviously, they have not persuaded the key people who can stop or reverse the construction. Here is another disturbing aspect of the fence: It is creepy to look at. This is no ethereal poetic running fence by Christo. It is certainly no meandering, hand hewn, charming, stonewall with ferns and moss tucked away. One glance at this would make anything, furry or otherwise, turn around, run and scream. S.A. I agree the wall is creepy and it certainly doesn’t address the situation or do anything to lift up the standard of living in Mexico that leads people to risk their lives to come to the U.S. Seems like resources could be better utilized elsewhere. D.T. There are people that complain about how money is misused or wastefully spent. This should be nearly at the top of the list. Sheesh. I buy coffee from Capulin Coffee, a coffee finca based in West Mexico. The owner once said to me that since his small company employs many of the people in the town/village no one in the town has an interest in getting into the U.S. This is a very small reminder that there are lots of ways one can help the situation. S.A. Are there any superstitions about birds that you respect? What are some of your favorite bird folklores? D.T. Of course, birds and culture have long been interwoven. I think it is difficult not to see birds through this prism. Owls are thought to be both wise and mysterious. If you have ever had an up close and personal connection with a great-horned owl you can see in its eyes that this is one shrewd beast. Owls seem to be imbued with an ancient presence that is indescribably powerful. The way that artists have depicted birds and etched them into culture resonates with me more than a lot of superstitions. I remember as a kid seeing images of the Egyptian God Horus depicted as a falcon-headed man. I just gassed on the stylized look and thinking how cool it was that there was this God that was part falcon. My family went to Vancouver when I was a kid and I saw eagles that were carved into totems. That was so memorable. The Edward Curtis’s staged photos of chiefs with eagle feather headdresses are jaw-dropping pictures — it was obvious that these chiefs also knew that eagles were great! And I spent so much time looking at Roger Tory Peterson’s Field Guide to Western Birds. I loved the simple flat schematic profiles of birds. Much of the appeal of birds is looking at how others have seen them. There is also the legend of the Tower of London where there are resident ravens and there is even a ravenmaster who takes care of them. The legend says that if the ravens ever leave the towers that the monarchy will fall. It is an amazing image to see the ravens strutting around the towers where traitors and witches were executed — they act like the own the joint. Those bad boys look formidable especially in this context. I find this legend very appealing and I don’t think you have to be in the goth or Dungeons and Dragons crowd to get the sense of wonder here. S.A. The ravenmaster certainly has a lot of pressure on him. And there are so many bad superstitions about ravens, but the whole British monarchy rests on a few of them. Talk about superstitious. D.T. Yes, ravenmaster must be a stressful job. I read that he had to make serious provisional plans to protect the birds from the avian influenza. S.A. Final question: Is there any bird you haven’t seen that you’re chasing down? D.T. There are so many spectacular birds, but I have started working on an art project to benefit the Philippine Eagle Foundation in Mindanao. The Philippine eagle is critically endangered mostly due to habitat loss/forest destruction but also because of hunting. This is a truly magnificent bird. The Natural History Museum of Los Angeles County has a skin (stuffed) of one of the beauties that I got to study and draw. They’re huge chocolate brown birds with a massive bluish beak and a lion-like mane. I am trying to get a buddy from 7th grade to come along on a research trip to see this gnarly beast. Hey, no pressure, Pete! The opening reception for Borderland Birds/Aves Fronterizas will be on Friday, April 16th, from 6 to 8 p.m. and is free and open to the public. The show will be up until May 29, 2010. Electric Works is located at 130 Eighth Street (cross street is Mission). David tells me that ordering coffee from from Capulin Coffee is very easy; he’s never had a problem. You just fill out this simple order form or email them. They’ll contact you for payment information. The coffee gets delivered by FedEx. Much more information on birds can be found here. Interesting picture of the wall is here. More photos of the border wall, creepy and otherwise, can be found by clicking this. And here is some recent news on the wall. Looks like they are going high tech—less wall, more cameras, laptops and thermal-imaging devices.